Godaddy is the World's largest domain name registrar and people use it for registering domain names for their websites and blogs. People choose Godaddy Domain because it's very cheap and you can easily pay with your credit card or local bank account and within a second you can register a domain name. They have more than 17 million customers worldwide and more than 73 million domain names under management with 24/7 customer service. Apart from that, they also provide website hosting at cheap rates. Hosting is where your website data will be saved. If you have a domain name registered but don't have website hosting then you can't make a website. 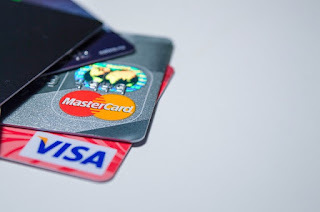 Godaddy offers a variety of payment methods to accept money like if you live in United States then you could use your Visa or MasterCard or UnionPay and you could also pay with your Paypal account or direct bank transfer but if you live in Pakistan like me then you can't use Bank transfer. For more you can visit Godaddy Payment Methods details. 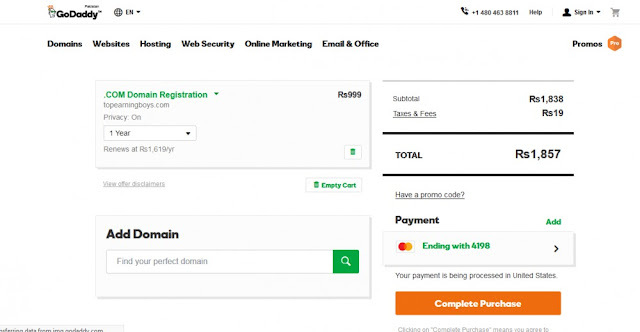 Before I tell you how to buy Godaddy domain I am going to tell you how I managed to buy the domain using UBL mastercard. When you are using a UBL mastercard then for buying anything online, you need to activate an internet session from UBL. For that you have to call UBL service centre and ask them to activate an internet session for you, they will take all kind of card details and a keyword which is a mother name basically. ( but in my case I had to visit my UBL branch to get my keyword) Then after complete verification from UBL, your session will successfully be activated and within hours you will be able to buy your domain. Now look at the top right corner and click on the Sign In button. Click Create My Account and after successfully creating your account sign in to your account. Now select appropriate options and then press Continue With These Options. 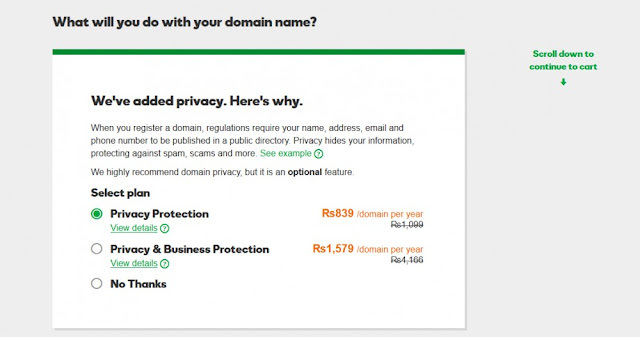 Within your Godaddy account, go to Domain Manager and click on your domain. You will see a window with RECORDS. Delete all the CNAMEs that are already present and make two new ones. One with name "www" and value ghs.google.com with TTL of 1 Hour. Now go to Blogger and login to your account and click on settings > basic. Under Publishing click on Setup 3rd party URL for Blog and enter your domain name in it. 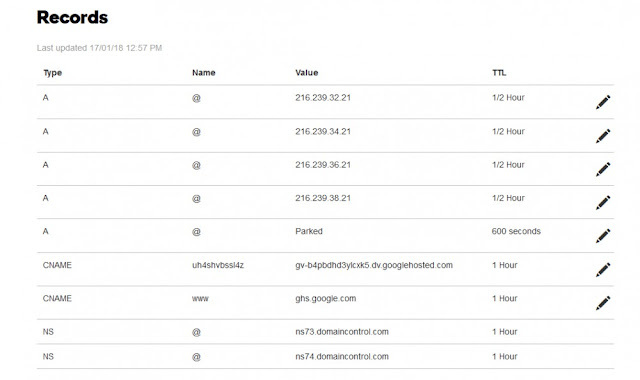 It will give you an error with two CNAMEs , add 2nd CNAME in your Records with TTL of 1hour. A-records will redirect your traffic from naked domain (without www) to www domain. Now add four A-records with values given below and TTL of 1/2hour. After that you are done! Now go to your blogger account and settings > basic. Under Publishing click on Setup 3rd party URL for Blog and enter your domain name in it. This time it won't give you an error and your Godaddy domain will be connected to your blogger account. Click on Redirect from domainname.com to www.domainname.com if you want your traffic to be redirected to www from naked domain. This is how you can buy and connect your domain from Godaddy with blogger since they changed their website theme. If you still have any issues, I am here for you, comment in the section below and thanks me later.